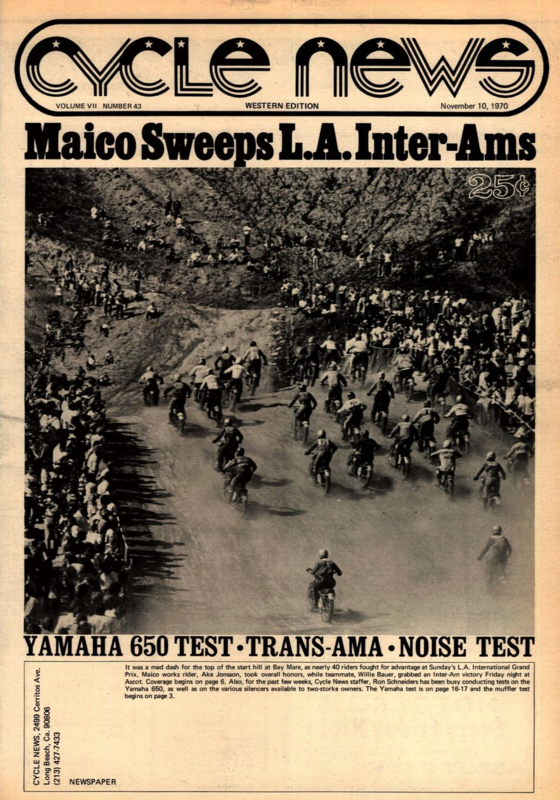 A pair of Inter-Am races were held on the weekend, with the first actually going off on Friday night (October 30) at Ascot Park under the lights, and the second at Moorpark (November 1) and what was called the Los Angeles Grand Prix. Maico riders won both as Willi Bauer won on Friday night over Ake Jonsson; Jonsson won on Sunday at the LAGP. 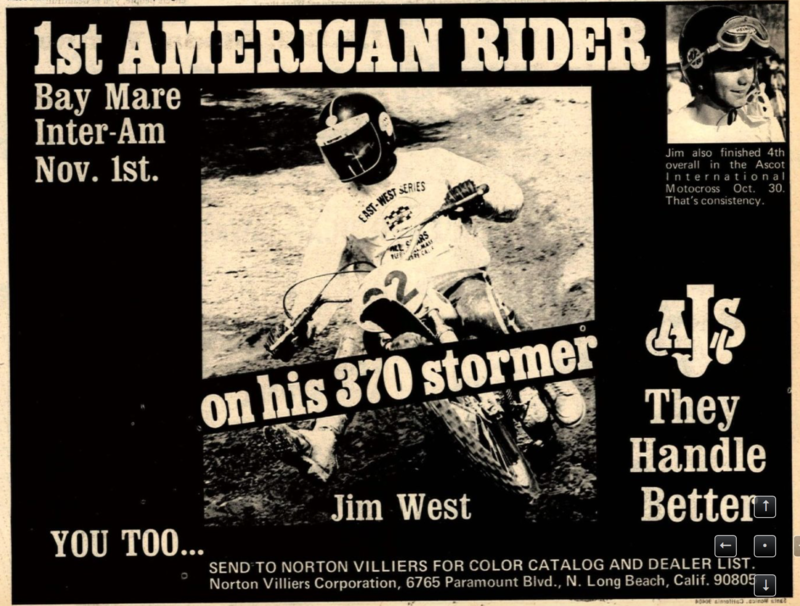 The top American rider in either event was AJS' Jim West, who actually led much of the third and final moto at Ascot Park. Meanwhile, the rival Trans-AMA Series was going off in Franklin, Georgia, and Suzuki's Joel Robert kept on rolling, winning all three motos. Behind him came John Banks on a BSA, Swedish Suzuki rider Olle Pettersson, and two more BSA riders, Dave Nicoll and Jeff Smith. The top American was sixth-place Jimmy Weinert on a CZ. For the second year in a row the versatile Steve Wise won the ABC Superbikers' competition at Carlsbad Raceway, this time aboard a works RC-500 Honda. 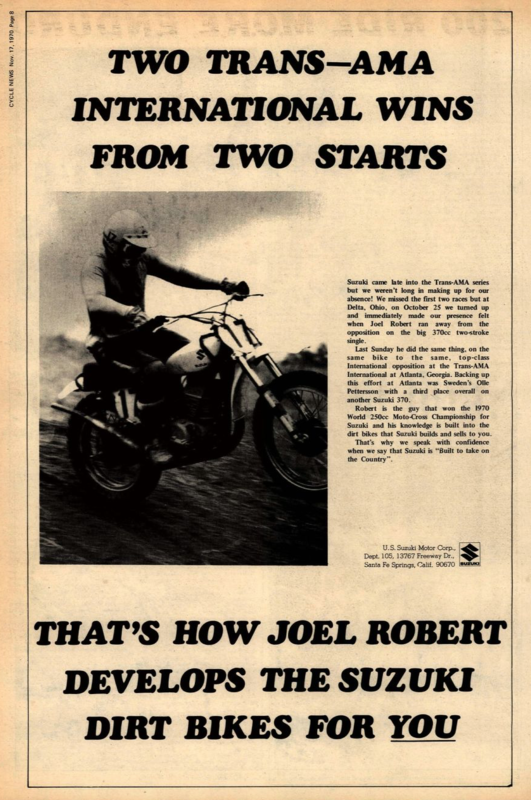 Wise, an AMA Pro Motocross and Supercross winner, was taking more and more of a liking to flat track and road racing and would soon use his prowess in ABC's made-for-TV Superbikers event to cross over to that form of racing. Honda's former 500cc World Motocross Champion Graham Noyce finished second. With pre-race favorite James Stewart in a Parisian hospital with suspected food poisoning, Toyota JGR Yamaha's Justin Brayton won the King of Bercy prize as the weekend's top racer at the Bercy SX in Paris. Stewart's L&M Yamaha teammate Josh Hill won the third and final night. Despite being absent, Stewart's wins in the first two nights of racing gave him second overall with French rider Gregory Aranda edging out Marvin Musquin for third.